and Fancy Feast blocking me to write a review. 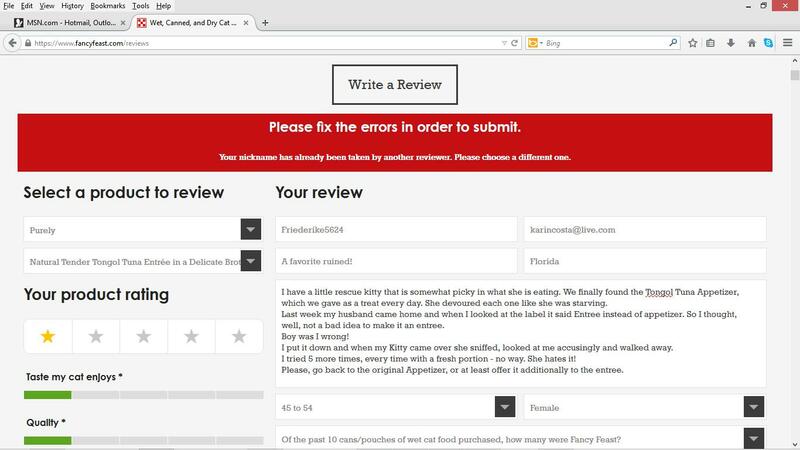 They have tons of bad reviews on their website already. People are extremely unhappy about their new formula for the Tongol Tuna Appetizer, which they call now Purely Tongol Tuna Entree. Cats all around hate it. We are trying to find good and healthy food for our kitty too. 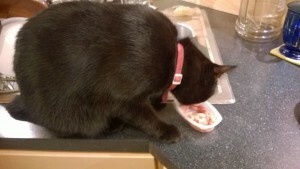 She is very picky and most the time she does not even like fresh raw food. So at least I give her no grain, no artificial flavors or colors, with meat for the first few ingredients. As a treat we found Tongol Tuna Appetizers for her. They have nothing but tuna as ingredients. She loved them and was always exited to get them. 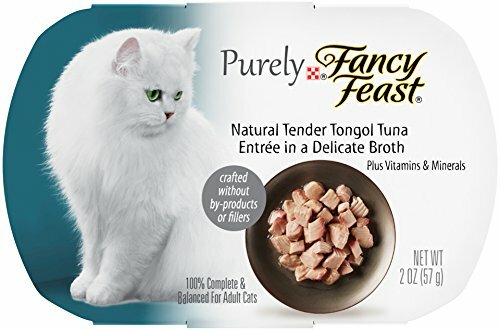 Last week my husband went to the pet store and brought home Tongol Tuna, but Entree and not Appetizers. So I put it out and she went there all exited, and then – sniffed, turned around, looked at me accusing and walked away. I tried several more times – the verdict is in – she hates it! So I was trying to find out what Fancy Feast has to say. I went on their website and searching a while I found the reviews. I read tons of them and not one was a positive review. Everybody said that their cat or cats hates those entrees. And there was no response to any of the reviews. Not one. I then decided to also write a review in the hopes that they maybe listen and bring back the Tongol Tuna Appetizer. After filling everything out I tried to submit and it told me that my Username was already taken. Ok, so I tried another one. Again, already taken. Tried another one, already taken. I tried 10 different usernames and I guarantee there were several that have not been taken – no chance! – but they refused to let me post my review. I guess they don’t want any more bad reviews of their product. And I did not write anything offensive or mean or whatnot. It was a regular review – unfortunately 1 star. I then went to Amazon and there Fancy Feast replied with generic answers and something like: we value your concern so please call us at…. to discuss. It is sad that a company does not listen to their customers. I understand, if it is maybe 10 or 20 customers, but pages full of negative reviews to a product should start making them see that there is a problem. I can only hope that they at least start producing and offering both – the Tongol Tune Appetizer and the Entrée. So customers have a choice. Thanks for bearing with me guys.